2019 Winter/Spring Circus Classes – Summer Circus Camp Registration Opening Soon! My Nose Turns Red offers your child the opportunity to run away and join the circus without leaving home. Learn how to juggle, balance on the rolling globe and learn the basics of creating a clown character. Classes are highly engaging; challenging youth to walk on the wire, balance on the rola bola and build human pyramids. Students play a wide variety of circus games that build teamwork and cooperation, trust and friendship. Boost your children’s self-confidence and creativity in a safe and non-competitive environment. 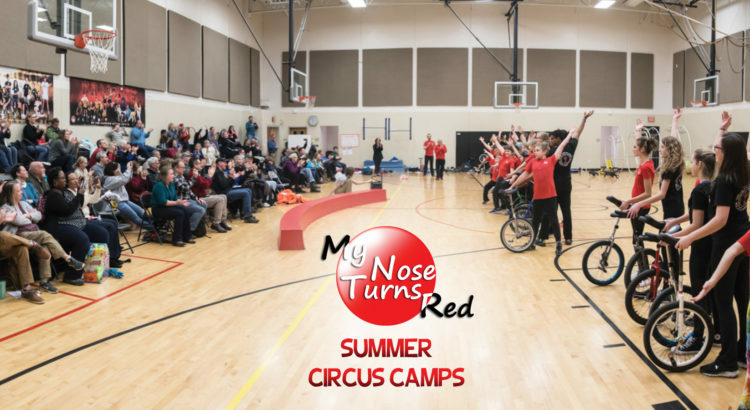 My Nose Turns Red classes are led by highly experienced, professional circus coaches and experienced assistant coaches. German wheel coaches are certified by Internationaler Rhönradturn-Verband. After-School Circus Sites offer youth a wonderful way to finish up the day after sitting in the classroom. The classes offer lots of movement games, balance skills, and object manipulation. Students have the opportunity to learn to balance on the rolling globe and the rola bola. Object manipulation includes the basics of juggling, the diabolo (Chinese Yo-Yo) and hooping. By far, the most popular skill is stilt-walking. Take the second 12-week session and the students will have the opportunity to perform in the 2019 Youth Circus Extravaganza!